Just a gentle reminder of this glorious truth, no? Bestest peak of all space-time in AO, IW, Hamburg(Madrid? ), Wimbledon, Cincinnati, USO, 1st fall (yes, Madrid 06 is the GOAT performance) and YEC (at least in the modern era). And that's me being cautious regarding Canada, certainly some of the more ardent devotees would put the legendary 2004 final up there with any other. YEC - Federer, Sampras, McEnroe, Borg, Lendl, Djokovic (6th). Djokovic 6th peak-level wise in Australia? Nevermind that Djokovic met Federer dozens of times in it, that was a thoroughly weakened past-prime Federer who wasn't up to snuff, unlike the strong era titans Roddick (mostly), Hewitt, Philippoussis, Nalbandian, Davydenko, Blake, Ancic etc. LOL. I know you're attempting humor and good read but Djoko is the sovereign in Australia man. 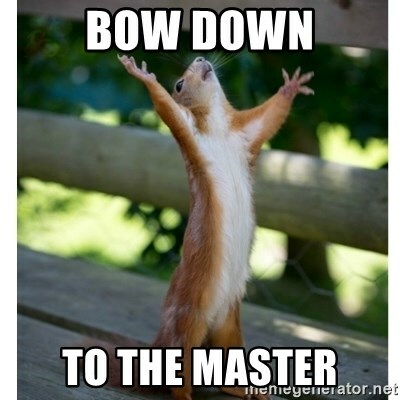 Everyone else, included Federer, will bow down to the master. As a guy who loves being ironic and cynic when illustrating this place, I love these threads. 11/10, 10 being the highest possible peak level and 11 being Fedr's peak. I mean, if one doesn't really rate Djoko's dominance, no reason why they can't argue any of this since we don't have a time machine, and all those guys did play extremely well at their best so it doesn't look idiotic on the first glance, but I'm rather skeptical of rating 1/2-time champions over a 7-time champion. It's not impossible, though. Oh, this could be interesting! These kind of threads always cheer me up. I guess one could rate and then debate on an outlier on peak level like Safin in '05 but then I have multiple options to rate from Novak: '08, '11, '16 & '19. For me, Djoko is the supreme Australian ruler but it's fun watching people argue this stuff. Wait, if that's true then Fed's not possible. That means he's not real, like sqrt(-1). So you're saying FEDR is a but a complex phantasm that needs to be squared to get something measureable, eh? Clever stuff. Safin was outstanding that one time, but even then Federer should have won in four sets. Djokovic 12-15 is beatable by that kind of performance, but not the better versions, I expect. It would still be a competitive match throughout, like AO 13 Wawrinka would give any Djokovic a competitive match. I think Djokovic would be vulnerable to Safin in his '13-'15 performances because that wasn't him at his absolute best but '12 Djokovic went 5 hours against Murray and 6 hours against Nadal to get the title so he would have been very hard to put away. He fought like a lion when his back was against the wall. Safin was outstanding that one time, but even then Federer should have won in four sets. Novak saved himself in the end, but those matches were pretty erratic throughout and should've been over in four sets if Djokovic showed some TBGOATness instead of playing a couple of wobbly points. Safin's clutchness in that 5th set is rarely mentioned but it was actually epic, he kept getting out of 0-30 and 15-30 holes on serve again and again; and after failing to serve it out after getting overeager on MPs, didn't let himself dwell on that, saved 15-40 in the next service game like a boss and renewed the pressure on return until he just returned first serves at Federer's feet and that was it. Federer should have won the first set, so it cancels the second set out. It was a classic Sampras strategy of holding comfortably, then suddenly putting all energy in one return game to break, so he did at 5-5, and Roddick had to save BP after BP with serving, but on the 4th try Federer got the chance, set up a mighty FH and missed it long. Roddick held, abandoned fear and launched a surprise attack in the next game that Federer wasn't mentally ready for and ended up broken to 30 out of nowhere and losing the set 5-7. I think Safin was a boss throughout that match and yes Djokovic was erratic at times in 2012 but I watched that final recently and it was some aggressive baseline skills from both Djokovic and Nadal in that one from the 1st point to the last. It was very intense and I would rate it as Djokodal's best match they ever played against each other. Djokovic would be tough to beat in 2012 for anyone in my opinion. Djokovic would be tough to beat in 2012 for anyone in my opinion. Not really. Djokovic gets a lot of bashing for his 2015-16 and 2018-19 competition as much as Fed. Nadal is the one a bit free of the fan hatred but he still gets called out a lot for winning to much on clay and skewing his H2H records. It goes all ways with these fanwars. Nole could have won it in 4 though. Every time needing 4 or 5 sets to beat Murray and Wawrinka indicates high level peak, right ?? The most intense baseline battle. A good deal of errors though, and mid-match was less intense that the first and last sets as Djokovic found the rhythm holding serve. 2018 Wimbledon is the best, I say, as it featured not only solid rallies, but great serving from both under pressure, and the match was super tight after the first set. In fact even the federers twins ( either set ) are far superior to other tennis players' kids and have higher peak then novaks who are at distant 6th or 7th place at best. This of course determined before any of them even held a racket. There's no such thing as kids weak era btw. Clearly wasn't here in 2015-16. Everyone worth considering knows those are shameless trolls and/or utter fools. What decent user is currently busy talking smack about The Greatest One? Meanwhile Fed bashing from 3-4 groups has lasted for over a decade now on various sites. Another great longevity record for Fraud. Player who has played the longest has been bashed the longest. What an eye opener. Yup. Let see if the Novak bashing continues as long. Who takes their openisions seriously but other fools? Federer won 12 GS in the absence of Nadal and Djokovic and 8 GS in the presence of Nadal and Djokovic. While all 3 play concomitantly, Federer has the fewest number of GS wins out of them. Great post but disagree about AO, Djokovic in 2011 is highest peak there imo. Federer’s 04/07 are close though. arguably Paris 2011 too? Wouldn’t argue Nole is better there but 2013 Fed took peak Nole to 3 sets. 2011 version would take it imo. YEC London 2010 Fed is a shout too. Vs 2012/2015 Nole. MC, Rome, RG clearly Nadal. Madrid clay probably goes to him too. Canada is probably Nole, just. I think it is. Not as off now but generally Federer fans are in the majority. Right now it is trolling from Novak fans but it was not always the case. For years it was Nadal the moonballer or PED cheat or the grunter. Now it is Federer the weak era champion from angry Novak fans. I agree at the current moment. I disagree. TTW is so pro-Federer that a statement like "Djokovic is the GOAT" is considered to be Federer-bashing, which is not. Both Lew and Spencer Gore are excellent posters that greatly contribute to TTW. There is strong mathematical evidence to suggest that Nadal and Djokovic played more difficult field than Federer and indicating that is also not Federer bashing. Bashing is when you call a player mug, doper, cheater, abuser etc. I can't count number of times I was plainly insulted just for having a different opinion. it would be a bit strange that hypothetical peak Fed is GOAT in so many tournaments yet of the three surfaces he may end up as GOAT of only one, and of the one that is played the least. Lol funny that this mythically good peak Fed disappeared once his cupcake rivals retired, grew up or gave up. A sad thing about Federer is that a lot of his fans hold his own 2004-2007 level against him as if he can go nowhere but down after that. In 2007, Federer turned only 26. He was in god mode because he was playing mental Smurfs. Even Annacone said Fed never really needed to develope a game plan because no great playera emerged after Sampras and Agassi retired.